MapMachine is a great resource available through the National Geographic website. You can get road map and satellite views of the earth, but it is more than your regular map website such as mapquest or google maps. It also provides a physical map showing the landscape as well as theme maps. The most interesting feature of this map website is the collection of theme maps. They are very useful for teaching geography. The theme maps include population density, habitats, natural resources, vegetation, mining, farming, natural disasters and weather. 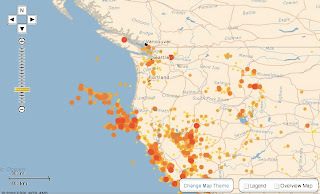 The picture on the left shows a map of the earthquakes on the west coast of the United States. The application also includes the usual feature such as the possibility to drag the map or zoom in and zoom out.